One year ago today our nations greatest sniper, Navy SEAL sniper Chris Kyle was tragically murdered. Today at the Superbowl, Hall of Fame quarterback Joe Namath will honor Kyle at the coin toss by wearing a custom bracelet honoring him. Namath tweeted this out earlier today. See his Twitter picture below. U.S. Navy SEAL Chris Kyle was celebrated for being considered Americas deadliest sniper with 160 confirmed kills out of 255 claimed kills. He was shot at a gun range by another veteran on February 2nd of last year. 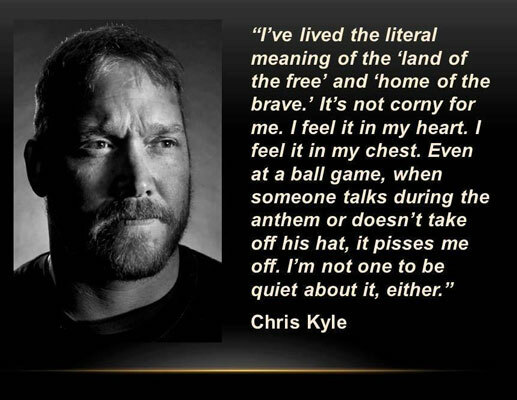 God bless you Chris and all of our fallen brothers and sisters. I will wear this bracelet today in honor of Navy Seal Chris Kyle. Thank you Broadway Joe, and God bless!